It was a cool late spring morning in Mexico City. I was up early, and the streets were still sleepy. The peddlers hadn’t even taken up their usual spots on the stairs down to the metro. I hopped on the metro easily, somehow missing the morning rush. The stop for the Basilica de la Virgen de Guadalupe is usually surrounded by a tarp covered marketplace, but even here just a few people were beginning to unpack their wares. I walked along in the relative silence, broken only when I asked for directions. Mounting the steps of the Basilica, I took in the view of Mexico City from this hilltop. The soft golden-white rays of the morning glittered through the omnipresent slight haze in the air, and the birds caroled around me. Pigeons toddled about. I crossed the great expanse of the plaza with the idea of finally checking this off my list. 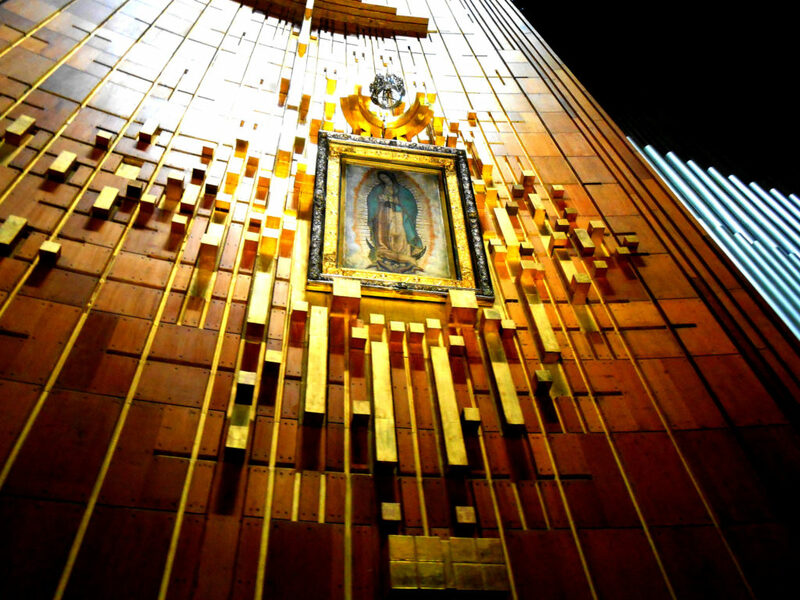 Even though I had been to Mexico City a number of times, I had not visited the Basilica of the Virgen de Guadalupe. My time was always engulfed by the Museo Nacional de Antropologia or the Zócalo. This morning I had carved out the time to be here and see the famous tela of La Virgen. I had no expectations – it was just something I felt I should do, just another stop on the tourist track. I walked in and followed the signs. The auditorium was enormous and almost empty at this hour. Only a few people close to the front and a priest intoning something in Latin. I turned the corner and saw three short moving sidewalks, parallel to the wall—two going one direction, and one in the other. The area was completely deserted. I stepped on one sidewalk and as I began moving, I looked up to the giant framed tela of La Virgen. I gazed into Her face, and She gazed into mine. I fell to my knees in front of Her, my heart cracked open, and I was filled with Her love. It seemed as if the sidewalk stilled. I was a supplicant, with un-thought and unspoken prayers answered in the rush of a moment. As the sidewalk reached its end, I stumbled off, shaken, filled, forgiven, cleansed, weightless and glowing. I stepped on the sidewalk moving in the other direction, and continued back and forth for quite a while. People began filtering in, joining me on the sidewalk, all eyes on Her. My hands covered my heart, feeling it renewed. I had not expected Her to touch me; I had not expected Her to heal wounds I hadn’t even realized existed. I hadn’t expected Her to answer prayers I had not even conceived. But I am a better person today because of Her gifts. ¿No estoy yo aquí que soy tu madre? Yes, indeed. Experience Guadalupe and the other Meso-American Goddesses in one of the Sacred Tours to Mexico through Goddess Ink!